Hi! New week and lots of possibilities ahead! Finally finished the mandala pattern. The yarn i have used for this one, is Mandarin Petit from Sandnes Garn. The colors I have used is 6705, 5212, 1001 and 6803. I used a 2,5 mm hook. You will need one skein of each color. You can also use Drops Safran from Garnstudio, but use a 3mm hook. In each round you start with a 3 dc cluster or a 3 treble cluster. Chain 2 for the 3dc (counts as the first dc) and chain 3 for the 3tr (counts as first treble). 1. Ch 6 and form to a ring with a ss. 2. Ch 1, 13 sc into the ring, fasten with a ss in the first sc. 3. In any sc, make a 3tr cluster, ch 1, next sc,* 3dc, ch 1* Continue ** round out. Fasten with a ss in the top of your first 3tr cluster. You will now have 13 3tr clusters with a ch 1 space between. 5. Sc in every sc. 39 sc. Fasten with a ss in your first sc. 6. Fasten yarn with a ss in any sc, ch 2 (first hdc) *ch 1, hdc in next sc* Continue ** round out. Fasten with a ss in the 2nd chain in your first hdc. You will now have 39 hdc with a chain 1 space between. 7. Fasten yarn with a ss in any chain space and ch 2 (first hdc). *ch 2, hdc in next ch space, ch 2* Continue ** round out. Fasten with a ss in the 2nd ch in your first hdc. You will now have 39 hdc with a ch 2 space between. 13. In any sc, fasten yarn with a ss and make a 3dc cluster. *ch 1, skip one sc, 3dc cluster in next sc, ch 1* Continue ** round out. The last round you will need to skip the two last sc. Fasten yarn with a ss in your first 3dc cluster. 58 clusters with a ch 1 between. 14. In any ch space, make a 3dc cluster, chain 2, *3dc cluster, chain 2*. Continue ** round out. Fasten with a ss in the top of your first cluster. You will now have 58 clusters with a ch 2 space between. 15. In any ch 2 space, fasten yarn with a ss and chain 3. Hdc in the same chain space (your first hdc v-stitch). Skip the cluster, *hdc, ch 1, hdc* in next chain space. Continue ** round out and fasten with a ss in the 2nd chain of your 3 chain. 58 hdc v-stitches. 16. In any hdc v-stitch, fasten yarn with a ss and ch 3, hdc in same ch space. Make a hdc vstitch in every hdcv . Fasten with a ss in your 2nd ch in the starting 3 ch. 58 hdcv stitches. 17. In any hdcv, fasten yarn with a ss. Make a 3dc cluster, chain 2, 3dc cluster in next hdcv. Fasten yarn with a ss in the top of your first 3dc cluster. 58 clusters with a 2 ch between. 19. Fasten yarn with a ss in any hdc, ch 1. Sc in every hdc. Fasten with a ss in the ch 1. 174 sc. 20. Fasten yarn in any sc with a ss. Ch 3 and make a hdc in the same sc (first hdcv). *Skip one sc, hdcv in next sc*. Continue ** round out. When you are making your last hdcv, skip the two last sc. Fasten yarn with a ss in your 2. ch in the 3 ch. You will now have 86 hdcv. 22.Fasten yarn with a ss in any hdcv space , puff stitch, chain 2, *puff stitch, ch 2*. Repeat ** round out. You will now have 86 puff stitches with a ch 2 space between. 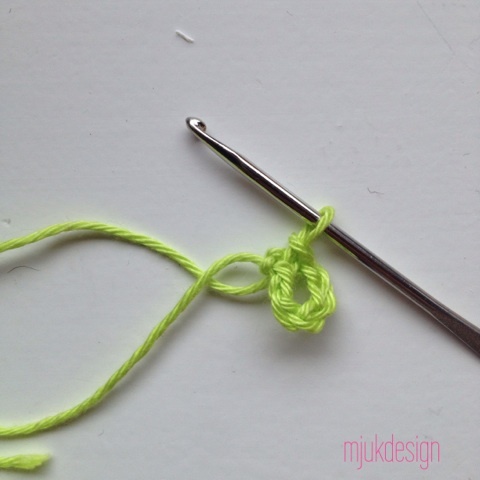 Fasten with a ss in the top of your first puff stitch. 24. Fasten yarn in any hdc, ch 1. Sc in every hdc. Fasten with a ss in the ch 1 you started out with. 258 sc.
. Edging time! time! Almost done! Use the same color as previous round. 25. *ch 2, skip one sc, ss in next sc*. Repeat ** the round out. Hope you all have a beautiful evening and please let me know if you have any questions! Previous Post The Joy coaster! Så utrolig fin! Hvor stor der den ca? I love your color combination! just wanna ask. 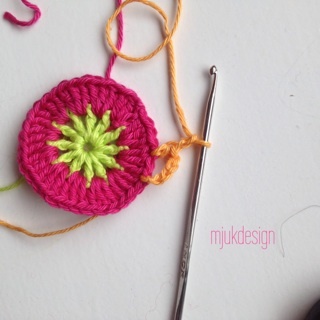 What is the size of the mandala you got using 2.5 mm hook? 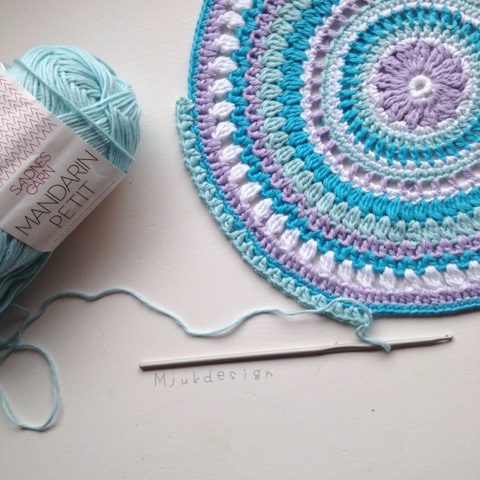 just wanna ask what is the size of the mandala you got using 2.5 mm hook? Hi! Thank you so much! I don`t have the mandala in front of me, but i think it was aprox 16cm in diameter. 🙂 Hope your day is wonderful! Vær en stjerne i høstmørket! 22 Chic and Trendy F… on The Viola mandala! Rita Cristina Frisso… on Lille nøste. Marvellous Mandalas… on The Viola mandala! 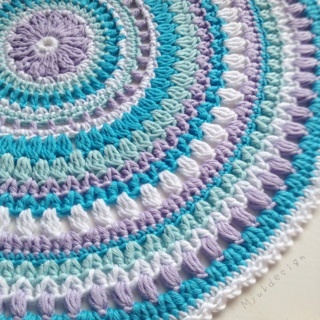 Mandala Prayer Rug… on The Viola mandala!